Emerald Green Cluster Earring set with Faceted 6mm green agates. 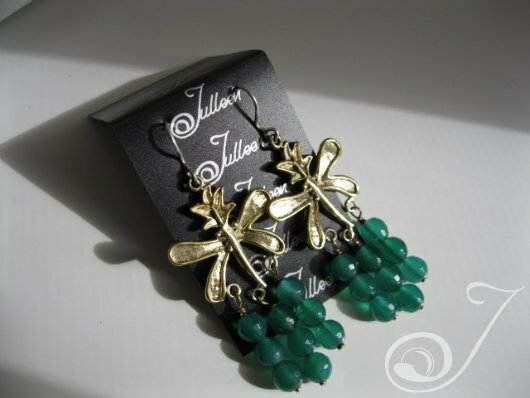 Dragon Fly Wings 25 x 35mm.3x Triple Drop Dangling Sparkly Stones on Sterling Silver Hooks. 45. These are the first earrings we’ve made in a brass motif…and I think the affect is amazing….we’ve tried hard to keep our pricing steady…even though silver has skyrocketed in price over these last years..but we’ve maintained our unique pricing…so to keep this gorgeous design under A$150 mark we’ve tried another metal…we believe in using natural metals in our jewellery and we are fairly sure it’s the key to most of our success…therefore although these mystical wings are brass… the hooks are of course….sterling silver.. and the each hand carved (facetted) bright emerald green, bead is added by hand too…this may not seem like much effort to some… but it’s actually a painfully slow process, as each bead is slightly different and so getting the clustered drop to swing freely… needs miniscule twists and turns to get the accuracy just right. Not complaining ….as we love making these gorgeous earrings….just letting you know that quality sometimes takes a little time to create. Attention to detail is part of our promise to our clients then and so we keep that flowing through every single design. We’re are able to make anydrop earring into a clip on version. We use a generic screw spring lock mechanism which when worn gives the affect of a pierced earring. We think the look is awesome. A suggestion when looking for a particular coloured earring do a search using google images.